As of May 1, 2019 this plan will be discontinued. The Iridium 750-min Global Plan offers low per minute cost for individuals and organizations planning to use satellite phones extensively for short-term or seasonal projects and events. 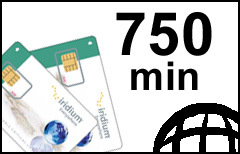 Upon expiration or depletion of included minutes, the account can be converted to other Iridium prepaid plans at no additional cost. Calls to rare destinations such as other satellite systems, premium numbers, etc. are more expensive ($7.82/min.) and will result in faster depletion of included minutes.